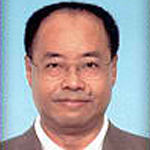 Lee Kam Wing was born in Hong Kong, in 1947 and his father Lee Chau was a practitioner of the Pak Mei style of Kung Fu. As a young child he would often watch his father practise with his Kung fu brothers but being a merchant he never taught the art of Pak Mei and only practised for his own health and self defence benefits. Lee Kam Wing was introduced to master Zhao Zhi Min by his maternal uncle while he was fifteen years old. He had spend ten years for learning the Seven-Star Mantis Style from Zhao Zhi Min. In 1972, Lee was encouraged by Master Zhao Zhi Min to set up his own Martial Art Association in Hong Kong in order to enhance and glorify The Seven-Star Mantis Style all over the world, Master Zhao Zhi Min also passed 4 sets of the Seven-Star Mantis Style practicing series and the practical medical prescription for treatment in osteopathy to Lee as a close door disciple. Lee Kam Wing is now giving lessons of the Seven-Star Mantis Style to his students in Hong Kong and giving treatment in osteopathy for wounded people. With a View to achieve an advanced medical experience in Chinese osteopathy, he had been completed a Chinese medical course in Acupuncture at the Zhaoqing Medical School in Zhaoqing City in China, and also, he had been finished an advanced course in studying the Chinese osteopathy from Doctor Ng Chung Lung who is a graduate from the most famous Fat Shan Orthopedic Hospital in Fat Shan City in China. Beside Master Lee is a sincere Buddhist. Since 1981, he had been studying the Buddhism under Master Kwong who is now the principle of the Hong Kong Buddhism Association. 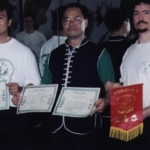 In November 1985, Master Lee Kam Wing was invited as an instructor of the Hong Kong Ching Wu Athletic Association for giving lessons on Seven-Star Mantis Style. 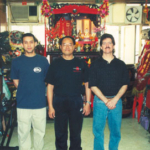 Master Lee Kam Wing started teaching Shifu Marquez in 1998 when he first came here to the USA and for many year’s he has sharpened his Mantis skills. Shifu Marquez was a sponsor for bringing him to the USA from Hong Kong to have him teach the local schools in the Los Angeles area besides having him instruct him and do workshops at the Shaolin Temple. Top masters from Hong Kong from him.